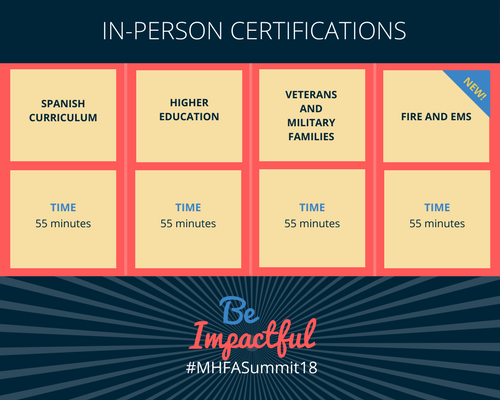 The agenda for the 2018 Mental Health First Aid Instructor Summit is now available for you to view. Join hundreds of Mental Health First Aid Instructors from across the country for a day of inspiration, education and IMPACT at the annual Mental Health First Aid Instructor Summit. The Summit is FREE, and it’s your chance to connect with both new and seasoned Instructors, learn from leading experts in the field and get energized to take your Mental Health First Aid initiative to the next level. A packed agenda will include expert panels on everything from cultural awareness to funding your initiative, inspiring stories from prominent public figures and special learning sessions, like these four in-person certification sessions to help you reach new audiences in your community. Need to convince your boss that they should send you to the Summit? Customize our letter to the boss and let your employer know why the Summit is a worthwhile investment. Don’t miss this annual opportunity to elevate your Menta Health First Aid Initiative. BE IMPACTFUL.